There's another new online slot game at Slotland this week! Lost World takes us back to a time when mighty dinosaurs ruled the earth. The new 5-reel slot has a Free Spins feature with Shifting Reels and Expanding Wilds. Its unique new Symbol Replacement feature gives a second chance at a winning combination. Until September 4th, take advantage of introductory bonuses that include a $12 freebie and up to 150% deposit bonus! $12 freebie and choice of deposit bonuses available until September 4, 2017. Lost World’s free spins are loaded with special features. Three “Free Games” Scatter symbol trigger up to 15 free spins. If there are four scatters the free spins include Wild T-Rex Symbols; five and the Wilds are Expanding Wilds. As the free spins begin, players click on a Raptor to reveal the number of free spins they’ll get. On winning spins during free spins, the new Shifting Reels feature causes the left reel to disappear and the remaining reels to move to the left. Winning symbols stick for next spin. The win multiplier is increased by on level (up to 5X) after each winning spin. After any non-winning spin, the Devour Bonus symbol replacement feature can randomly gobble up one symbol and replace it with another, potentially improving the result of the spin. 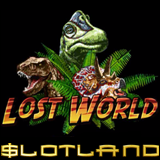 Until September 4th, Slotland is giving all players that have made a previous deposit a freebie to try the new Lost World slot game. A choice of introductory deposit bonuses with various wagering requirements is also available until then. 12X wagering requirement, 10X max. cash-out (VIPs 20X). Valid for Lost World only. 15X wagering requirement; valid for Lost World only. 12X wagering requirement; valid for all slots and progressive jackpot games..
9X wagering requirement; may be claimed twice a day; valid for all slots and progressive jackpot games. 6X wagering requirement. May be claimed three times a day. Valid for all games. Lost World is the latest game to be brought to Slotland from its partner site, WinADay Casino following Zodiac, Tropical Treat, Full Bloom, Olympus, Gypsy Charm and Fluffy Paws. Most of Slotland’s 60 unique games, including the new Lost World, are mobile friendly and can be enjoyed anywhere on Apple and Android smartphones and tablets.